Now, I get a lot of such recommendations from a wide variety of people. Some have been films that made me think a little bit more, made me feel a little bit more, even made me cry a little (though in order to protect my macho reputation, I shall not reveal that ‘Love Actually’ is the movie in question). Some, admittedly, were as pure as 100%, Grade A, New Zealand horse crap. I don’t actually know how many horses they have in New Zealand, or even the type of horses they breed slightly south-east of Down Under, but they can’t be that great. We just need a cat now for PCD. Much like everything else, I’ve come to develop a system that basically serves as a filter. Some people you listen to, and others you don’t. My friend, on the other hand, has an almost encyclopedic knowledge of Malaysian and Indonesian movies. Quite frankly, he puts me to much shame in that particular department. 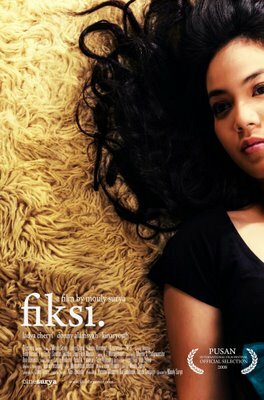 And so, with such great authority on the subject, I took some time out and checked out the fiction that is ‘Fiksi’. We basically follow the lead of a young, pretty, rich girl named Alisha (Ladya Cheryl). Despite having pretty much everything at hand, she suffers from the lack of parental guidance. Her father, a successful businessman, basically rules the house that he’s hardly in with an iron fist, restricting her so much that he might as well have been the invisible Boa constrictor. He’s not particularly all bad, I suppose; in one scene, he played a hand in securing Alisha a job. Alisha, having been loaded up on Destiny Child’s ‘Independent Woman’, abhors this, as she wants to make her own way. Her mother is also not around, having died a terrible death when Alisha was a young girl. The lack of such stable parenting influences, then, made for a pretty disturbed little girl. The presence, however, of a good looking pool boy invokes a very different reaction in Alisha. Bari (Donny Alamsyah) has a habit of stealing little things from the big house that he works in. Alisha knows that he does this, but rather than turning him in, she decides to follow him all the way back to the crowded flat he calls home. As time goes on, and growing tired of her own life, she eventually decides to run away, and moves in next door to Bari and his girlfriend, Renta (Kinaryosih). The Monash corridors are scary at night. This is where the fun begins. Getting to know Bari better, we find out that he is an aspiring novelist, and one who is basing his current work on the lives of the people who live in the flat. Being the good neighbour that he is, he takes Alisha on a tour of the place, and shows her the eccentric yet compelling collection of people there. Problem is, Bari’s work is stalled. He’s having the writer’s block, and a big part of that is due to the fact that while incestuous gay couples, a protesting old man, and a reclusive cat lover may make for a nice basis for a story, if their lives don’t move along quick enough, neither will his story get to the end in good time. Alisha, taking good note of this, duly set out to transform his life by transforming the lives of those in his story. And not necessarily in a good way. Initially, I had approached this film with a philosophical mindset. I had thought that my friend meant that the film worked well as one that blurs the line between fact and fiction, reality and perception, and so forth. I’m always in the mood for one of those, so that was the mindset I came in with. However, after having seen the film, to say that that is what the film is all about would be an injustice. The film does explore that, but I feel that the thriller elements are far more well-done. There is a certain feel, a certain sense of power, with what was going on on-screen. The colours, well-defined but gloomy in a lot of the important parts, helps to create an atmosphere of unease, fear even. Yo-yo Ma doesn't seem so inspiring now. It is the acting, however, that really got my juices going. I’m not even talking about the performances of the lead actors, even, fine though they are. Ladya Cheryl’s transformation from lonely girl to seductive vixen was…well, let’s say that if she ever set her sights on me, I wouldn’t mind being ensnared in that trap. What I am banging on about is that of the protesting old man (Jose Rizal Manua), one of the cacophony of characters in the flat. He is protesting the fact that his old home was demolished to make way for the flats. The authorities gave him a unit, but still aggrieved by the decision, he does not move in. His family does, however, leaving him all alone outside the flat. His performance, though short, is one of the most moving performances I have seen for a long time. His face is etched (and I mean etched) with such emotions that I was incredibly moved. “If I go into the house, it means that they have won. I can’t let them win.” Even if the whole movie had tanked, I would still have been glad to pay for the admission just for that particular performance. Of course, the rest of the group did well too, and as you may guess from this review up till now, it didn’t tank, either. Everything is crafted like a nice little jigsaw that comes together nicely. Much credit must be given to Mouly, then, for such films can be tricky to be done well. It’s not that often that you come across a film that is well-developed, neatly-rounded up, and gives you a nice feeling of satisfaction right up to the very final frame. Echoing my friend, I will now tell you that if you ever get the chance to watch it, you should. And not just because Joko Anwar wrote the script. Fikri also cried at ‘Tokyo Story’. Help! How can i get this film? I have no idea. You can wait for it to be released on DVD or VCD, perhaps. A lot of Indonesian films make their way to Malaysia one way or another.